Once an extensive amount of natural teeth have been lost through disease or injury, even the simplest, most essential of daily activities like eating favorite foods and speaking clearly can become embarrassingly difficult. At Roselle Park Dental & Implants, our doctors and team members strongly believe that it’s never too late to regain your best smile. There are multiple full mouth implant solutions available to you here in Roselle Park, NJ that can recreate the strong, attractive teeth you need to enjoy a higher quality of life. Please contact us today if you’re ready to schedule your first consultation with Dr. Oshidar. The last thing our team wants to do is leave you without any teeth to smile with, eat with, or enjoy life to the fullest with. That’s why we highly recommend Teeth in a Day as a great solution to extensive tooth loss. With this state-of-the-art technique, Dr. Oshidar is able to complete a high-tech CT scan, surgically place the necessary implants, and fabricate a non-removable appliance to attach on top all in the span of one appointment, creating a newly recompleted smile that is immediately functional. 85% of patients walk out of their appointment the same-day with new teeth! Overdentures (also known as “implant-supported dentures”) are customized prosthetics that are designed to replace an entire arch of teeth, whether it’s the top, the bottom, or the entire mouth. If you’re feeling frustrated with the lack of stability, embarrassing slippage, and unpleasant adhesive use associated with traditional dentures, these appliances can provide your smile with a much greater degree of stability and permanence, as well as valuable oral health benefits. Overdentures can be permanent or removable in nature, depending on the patient’s current health and personal preferences. 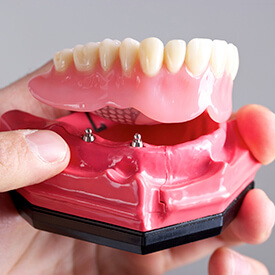 When comparing implant-supported dentures to traditional dentures, our recommendation is entirely based on the patient’s unique needs and personal priorities. Dentures retained by implants offer several valuable advantages to your ongoing oral health and quality of life, including increased function, elevated aesthetics, impressive durability, and more effective jawbone preservation. However, traditional dentures do provide more affordable coverage and convenient removability, which is preferable to some patients here in Roselle Park. Many patients are surprised to learn that it’s not always necessary to have a brand-new denture created when they decide to invest in the transformative power of dental implants. If your current denture is in good condition, Dr. Oshidar can retrofit them with attachments that can be supported by newly placed implants, providing valuable stabilization and increased function. We know that you’ll be amazed by the improvements such a seemingly small change can create for your overall health and quality of life!